Helps traffic to flow smoothly. Removes the truck driver's cushion of safety. Helps the truck driver to see the road better. 4. Using Lincoln's head on a penny is an easy way of checking what? Be appreciated for your skilled driving. Increase your chances of a collision. Only the intersection is controlled by traffic lights. Even at an unmarked crosswalk. Lock the door, but can leave the motor running. Stop the motor, set the parking brake and remove the key. Stop the motor, but do not need to set the parking brake. Set the parking brake, but can leave the motor running. Speed up to the same speed as the tailgater. Brake hard to discourage the tailgater. Pull off the road when it is safe and let the tailgater pass. Enter in the right lane. Enter in the left lane. 12. If you see an accident ahead, how can you warn drivers behind you? By driving in the middle of two lanes. By slowing down and stopping. By turning on your high beam headlights. By tapping your brake pedal quickly. Allowed if the other vehicle is turning left. Allowed if the other vehicle is going too slowly. It is safe to pass in the same lane. Don't always assume the motorcycle is turning. Pull out in front of the motorcycle. 15. When are collisions more likely to happen? When one driver goes faster or slower than the flow of traffic. When one driver is using the left lane. When there is no speed limit. When all vehicles are traveling at the same speed. Look ahead for road conditions and traffic. Drive up close to the vehicle you want to pass. Drive off the paved or main traveled portion of the road. Just after entering the curve. During the entire time you drive through the curve. Only if the police did not investigate the accident. Unless you filed a report with the DMV. Reduce speed by 10 mph. Reduce your speed to 50 mph or less. Keep your speed at 30-35 mph. Reduce your speed to a crawl. Turn on your turn signal at the end of the off-ramp. Make sure you are in the proper lane to exit. Speed up to find a gap in your exit lane. Slow down before you enter the off-ramp. Legal if it is a prescription drug or an over-the-counter drug. Legal if it is a prescribed by your physician. Move into the right lane, if possible. Keep as far left as possible. 4 feet 9 inches tall. 3 feet 6 inches tall. 3 feet 9 inches tall. 24. When are you required to stop at a railroad crossing? When there is more than one track. When pavement markings before the crossing include a stop line. When flashing red lights are activated. 25. Can you make a U-turn across a double yellow line? Yes, but only outside city limits. Yes, when safe and legal. Decrease your following distance to any car ahead. Slow down to watch the ongoing work. You can stop for the time posted to pick up or drop off passengers or freight. No stopping, standing, or parking at any time. You can park for a limited time. Parking is permitted only for a disabled person. Drive at the posted speed limit to make it through the water. Slow down and avoid the puddle, if possible. Shift to neutral as you drive through the water. A road where you may not enter. California Permit Practice Test - 6 You got %%score%% correct answers of %%total%%. %%details%%. This, and all other permit practice tests at california-dmv-practice-test.org, is designed to help you prepare for your California Driver’s License or Learner’s Permit. The practice test has 30 questions, slightly less than the real examination. On the real test, you get 46 questions if you are under 18 years. If you are 18, the permit exam has 36 questions. Should you already have a California License and is asked to take the license test again, the renewal test has 18 questions. A practice test is a great way to prepare for the examination at California DMV! It’s even better when you get questions and answers for free, which is exactly what you’ll find here. We offer free online practice tests and several knowledge articles to help you get your permit or license quicker. Our practice tests cover all important topics in the Driver Handbook and any driver’s ed class. But don’t skip the handbook and think that practice tests are enough. Simply memorizing questions and answers may help you a lot when it comes to passing the exam, but doesn’t make you a great driver. Learning rules of the road and California laws takes time. The more time you’ll give it, the better the knowledge will stick. So, get yourself a copy of the California Handbook and read it. Make sure you have the latest version, since laws change almost every year. Vision test (if you wear eyeglasses or contact lenses, bring them with you). Road test or “behind-the-wheel driving test”. You must make an appointment to take the road test. It is waived if you hold a License from out-of-state or a U.S. territory. You take the knowledge test on an automated test terminal with a touch screen terminal. You can probably still get a paper test, if you ask for it or if you have trouble using a computer. 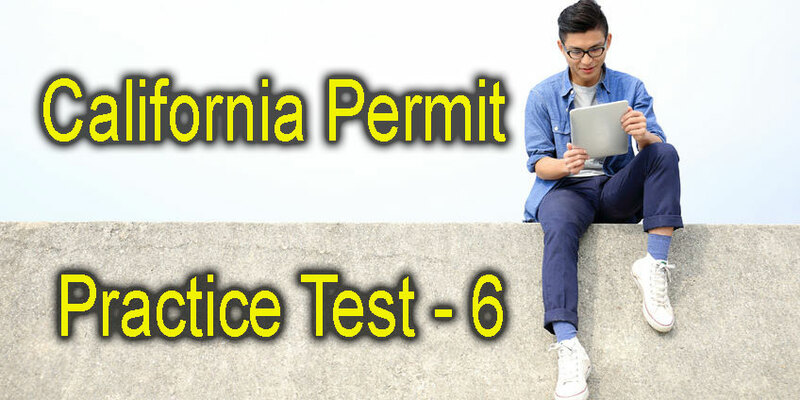 Be the first to comment on "California Permit Practice Test – 6"